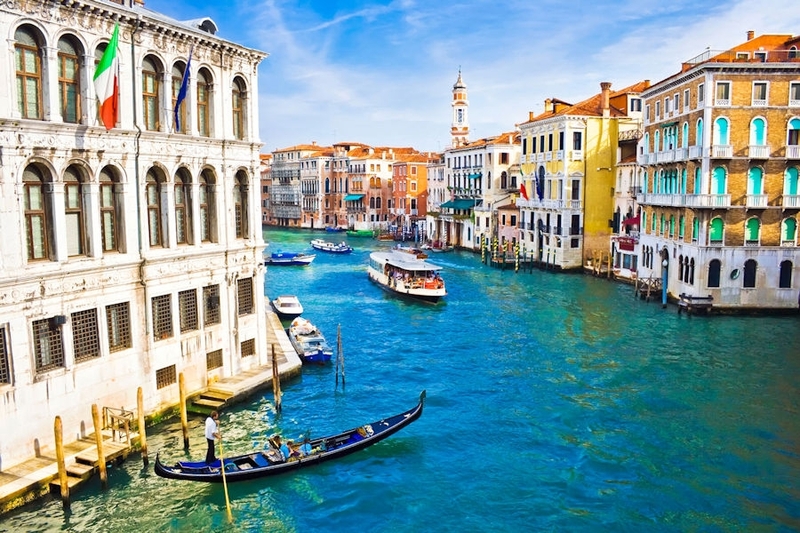 19 Days "Jewels of Italy & Greek Islands" package: Includes flights, 7-day Trafalgar tour of Italy from Rome, five extra nights staying in central Rome and Venice, 8 days cruising from Venice through Croatia to the Greek Islands. Replace the cruise with our Athens and Greek Island hopper package from $0 extra. All top-class accommodation and many meals included. Save more than $2,600 per person off retail. Limited FFV (Free Flight Voucher) packages. Request itinerary and pricing for your travel dates. From the grandeur of St Peter's Cathedral and the Sistine Chapel to the intrigue of the Leaning Tower of Pisa; from the beauty, history and magic of Venice to the charm of the seaside towns of Split and Dubrovnik in Croatia; then cruising to the stunning Greek Islands of Santorini and Mykonos... Can you imagine a better holiday, and better value? * Various itinerary options are available. See full itinerary for details. Package price varies according to season and departure city. In the style of most Global Escapes Independent Traveler itineraries, this is a perfect blend of self-guided adventure and forward-planning to ensure that the main elements are organised in advance allowing for plenty of time to relax and take in each place you visit. Getaway Cash travel credits are used to reduce the price of your travel from retail down to wholesale. Free Flights Vouchers further discount flights. Simply submit a booking enquiry and we'll automatically provide you with a 3-month Travel Club Trial account. No payment is required and you get instant access to member prices. 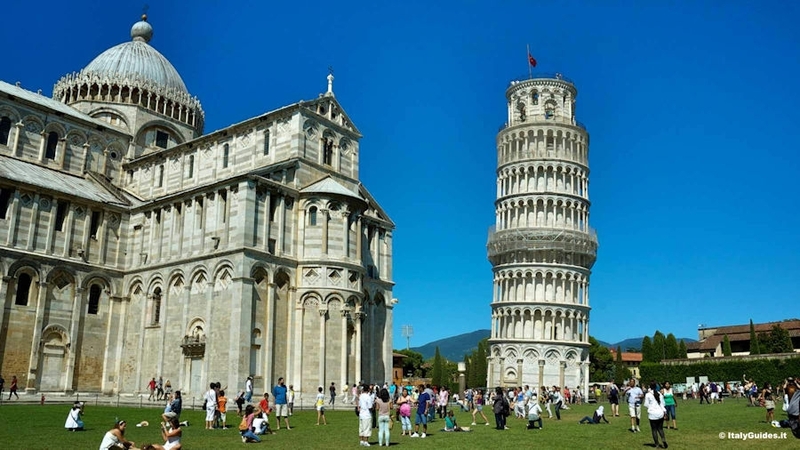 "Italy is home to many of the world's greatest works of art, architecture and gastronomy. Greek culture is alive with passionate music, inspired cuisine and history. We combine these experiences and more on this trip." You’ll explore Italy's sophisticated capitals of Venice, Florence and Rome. The beautiful cobblestone squares, centuries' old tradition and historic highlights like the mighty Colosseum, Leaning Tower of Pisa and the spectacular Duomo of Florence are amongts the places you'll visit. Plus you get to spend plenty of extra time in Rome and Venice to see and do things most travellers never do. Your cruise from Venice via Croatia to the Greek Islands will give you you a taste of the good life cruising the Mediterranean as well as the experience of several great destinations including Santorini and Mykonos. This is a first-class travel itinerary that's fully flexible. Want more or fewer days or you want to include a special destination or activity? No problem, we’ll customise a travel plan for you. 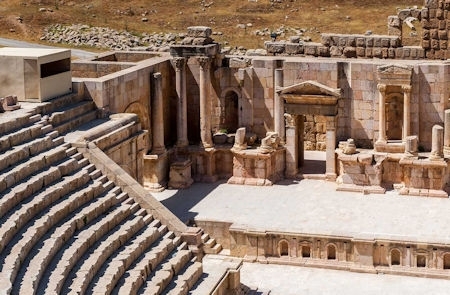 Trafalgar's carefully crafted trips showcase just how diverse the world really is. There's always something incredible to discover on your next journey. It might be a minute, an hour, a day: it's a moment you didn't expect, but one that will change the way you see the world forever. Click/tap to watch this short video and learn about the sights and beauty and that await you. "Bella" experience cabin included. Various cabin upgrades available with surcharge. 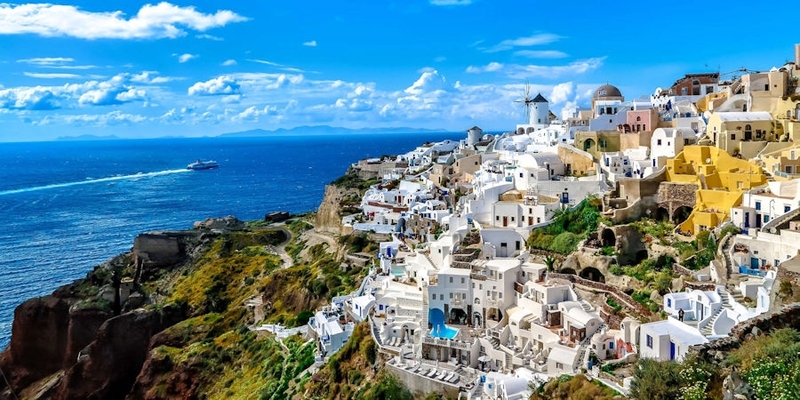 If you'd prefer to have more time in the Greek Islands, our Athens and Greek Island Hopper package replaces the cruise from Venice from $0 extra. All accommodation is hand-picked, central and 3.5 to 5-stars. Sea view accommodation on the islands is included subject to availability. This itinerary is fully customisable to suit your requirements. Your personal travel consultant is available to discuss changes and additions that will enhance your travel experience. Add comprehensive, best-in-class, travel insurance for just $699 per person*, valued at over $2200 per couple. Full insurance cover details are available on request. Lonely Planet is renowned for its first-hand approach, up-to-date maps and commitment to providing the best information for travelers. 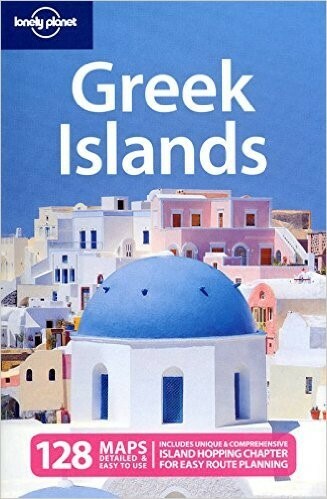 Lonely Planet authors are experienced, insightful travel experts. 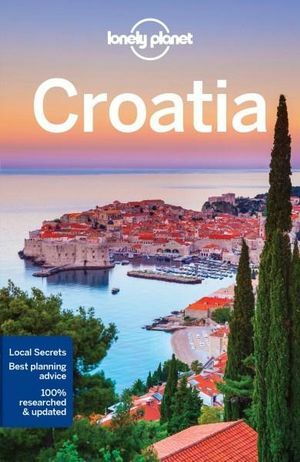 They personally research the places they write about - both in the first and in subsequent editions - and provide essential travel details along with a wealth of insider information and first-hand tips. You will receive these guides to help you gain the most out of your holiday. Recommendation: Take the time to read suggestions for things to see and do before you leave home. Take your Lonely Planet guides with you in your luggage. There's nothing worse when travelling on a long flight than not being able to lift your feet and get comfortable. 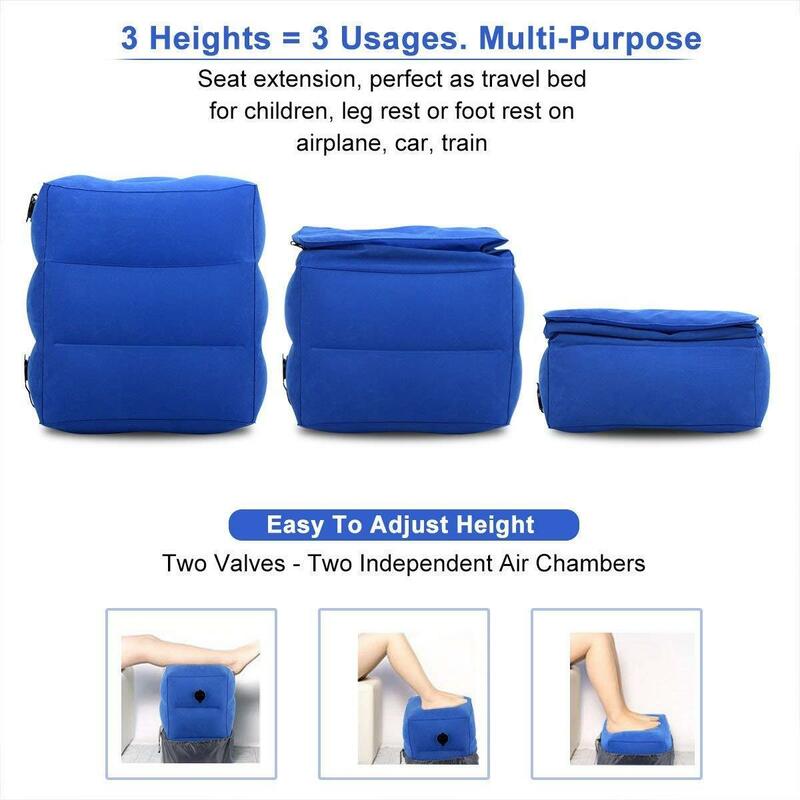 Say "hello" to ultimate travel comfort for your legs and feet. We'll include 2 of these as a gift. You can thank us when you return. * All prices are per-person on a twin-share basis and all bookings are subject to availability. Price and deposit amount varies according to travel date. A flight cost provision (allowance) applies. Total price after Getaway Cash credits and Australian Escapes Free Flights Vouchers is generally payable as follows: Deposit on booking, balance 120 days prior to departure. Packages can be priced for families and groups on request. All prices are estimates only. A firm quote (travel plan) with payment terms will be submitted for consideration prior to booking. Standard (retail) price comparisons are with similar packages offered elsewhere or what would be payable by a non-member for the same package. Flight pricing included in packages or other estimates is based on travel from Sydney, Melbourne or Brisbane. Travel can be arranged from any other major centre and for any number of people. Travel insurance pricing if stated is based on two travellers aged 69 years or less as at the date of departure from Australia. Surcharge applies for travellers aged 70 years and over. 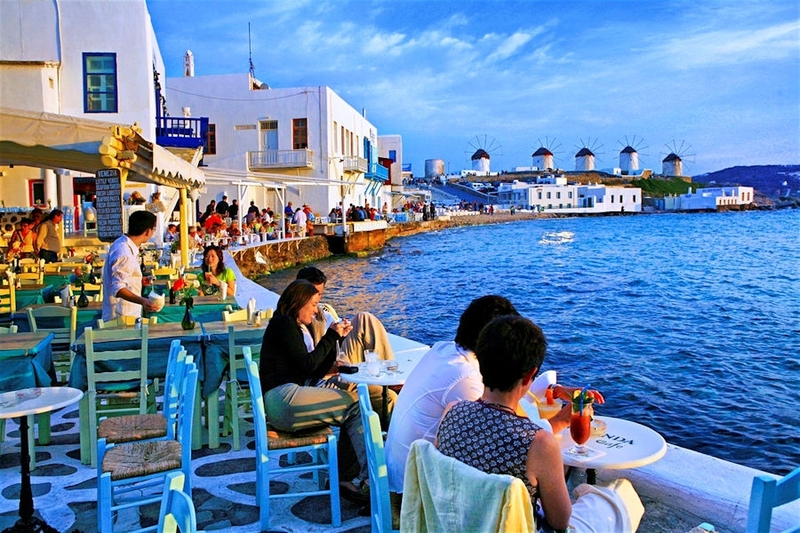 Surcharge may apply to Greek Islands package depending on the time of year. Full booking terms and conditions are available here. 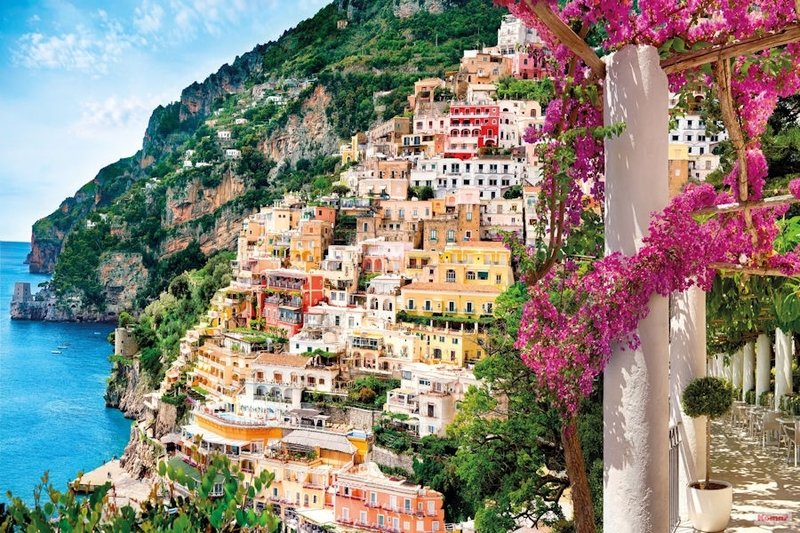 Discover some of the many highlights of Italy and the Greek Islands with this value-packed itinerary. We've slowed the pace in Rome and Venice so you can really get to know and experience these places in more depth. The tour and cruise inclusions mean that you can meet other travellers, one of the most enjoyable and memorable aspects of this type of travel. You also have the option of swapping the included cruise with our Athens and Greek Island Hopper package. If you're an independent traveller, that will give you time to enjoy Athens and up to four of the wonderful Greek islands at a leisurely pace. If you want to see more of Italy, our 5-day Italian Lakes package offers terrific value, as does our Tastes of Southern Italy package. See the options section below for details. Welcome to Rome. After checking in, relax and unwind. 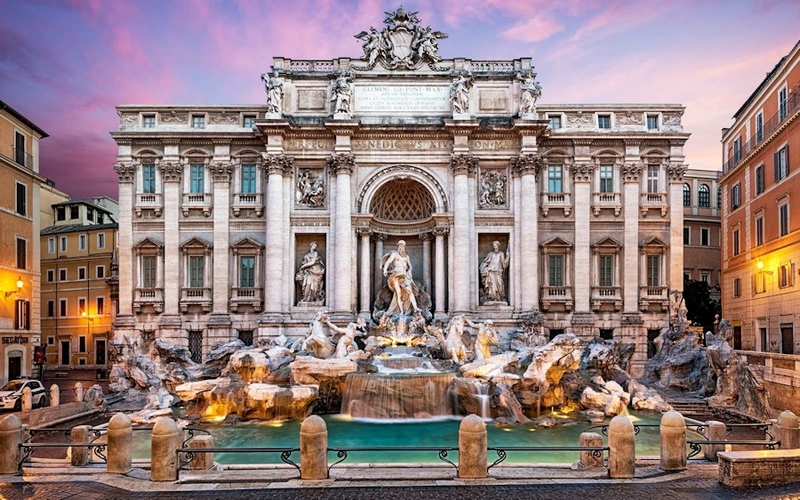 From your central location you're within easy walking distance of many of Rome’s famous attractions such as Trevi Fountain, Spanish Steps, Pantheon and Piazza Navona. This evening consider a stroll around this fascinating ancient city and mingle with the locals in beautiful squares with stunning architecture. Have dinner at a very Italian Trattoria and enjoy a pizza made in the traditional way while sketching out the rest of your first few days and evenings in this great city. 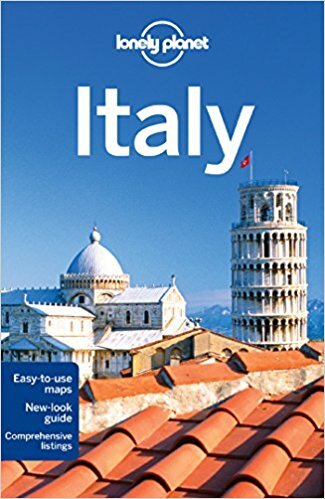 Your Lonely Planet Guide will provide you with plenty of options for places to visit and things to see and do before joining your tour group. Today will be a great opportunity to see things not included in the upcoming tour. 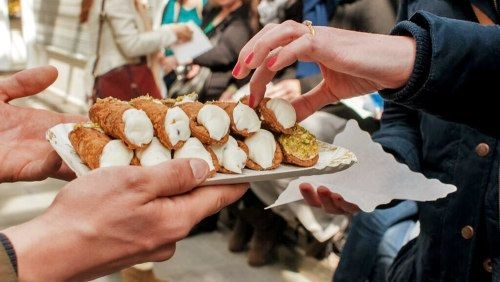 Rome is known for having some of the country’s most loved street food. From ancient classics like suppli’- fried risotto balls oozing with fresh mozzarella cheese- to the the trendy Trappizino- a hybrid of pizza and a calzone filled with signature Roman dishes like braised oxtail, you will enjoy them all. 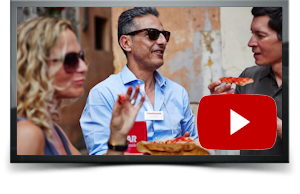 This unforgettable food and cultural experience will give you a taste of daily life in one of Rome’s most iconic neighbourhoods, Trastevere. The morning is free for you to enjoy a casual stroll through one of Rome’s wonderful markets or take in some sights remaining on your list. Later you’ll head to the tour start hotel to meet with your Travel Director and fellow travellers. One of the great joys of travelling with a Trafalgar tour group is making new friends and experiencing many new places as a group. This certainly adds to the experience. 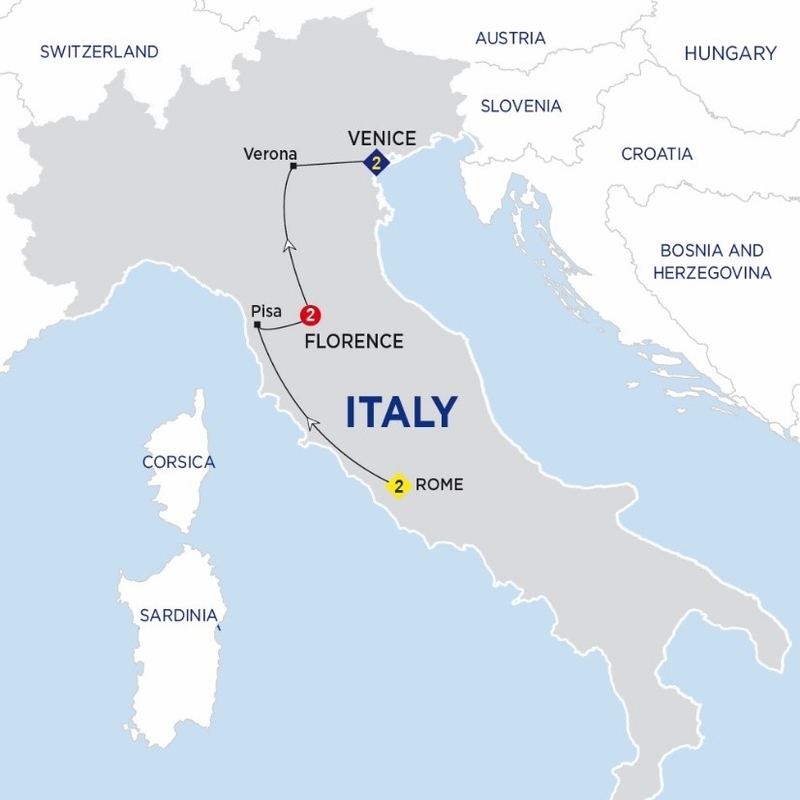 On this tour you’ll explore Italy's sophisticated capitals of Venice, Florence and Rome. The beautiful cobblestone squares, centuries' old tradition and historic highlights like the mighty Colosseum, Leaning Tower of Pisa and the spectacular Duomo are included in your group tour of this fascinating destination. Your local specialist takes you on a sightseeing tour with a visit to the Vatican City. Enter the awe-inspiring St. Peter's Basilica and view Michelangelo's statue, the Pietà. 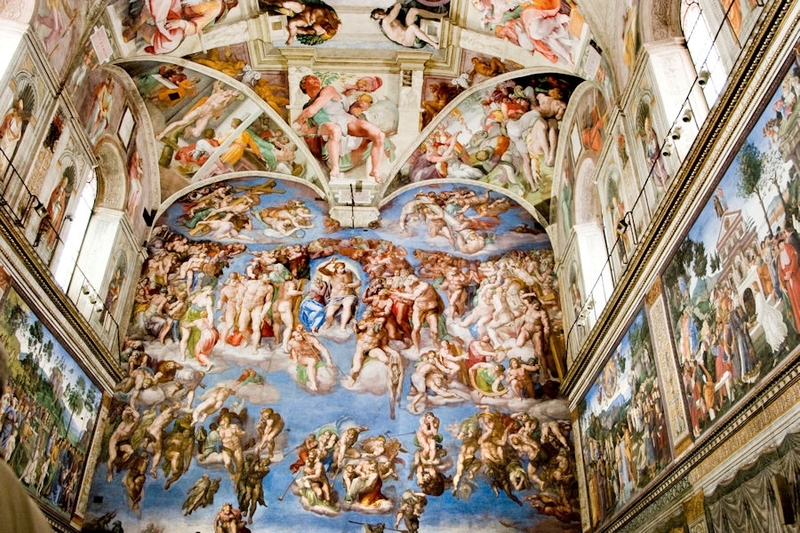 Don't miss the opportunity to join an Optional Experience to visit the famous Sistine Chapel and Vatican Museums. View the mighty Colosseum and see the ancient sites of Rome. 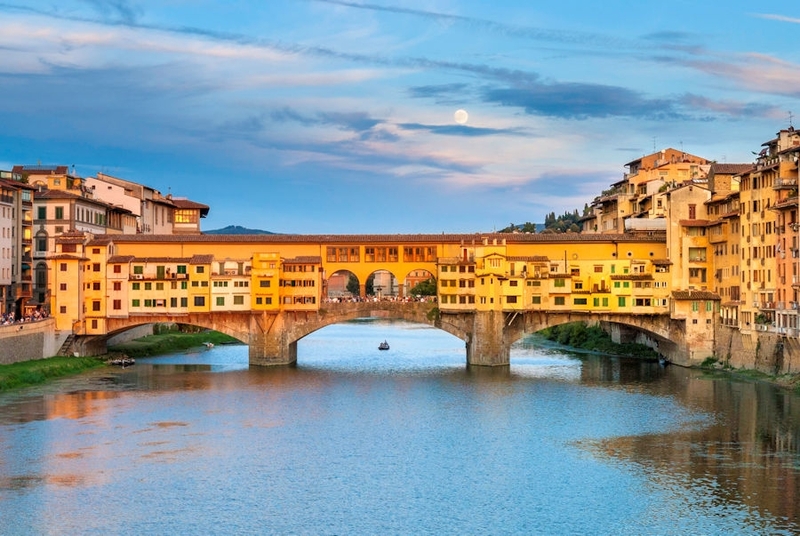 There are few cities in the world with an artistic legacy to equal that of Florence. 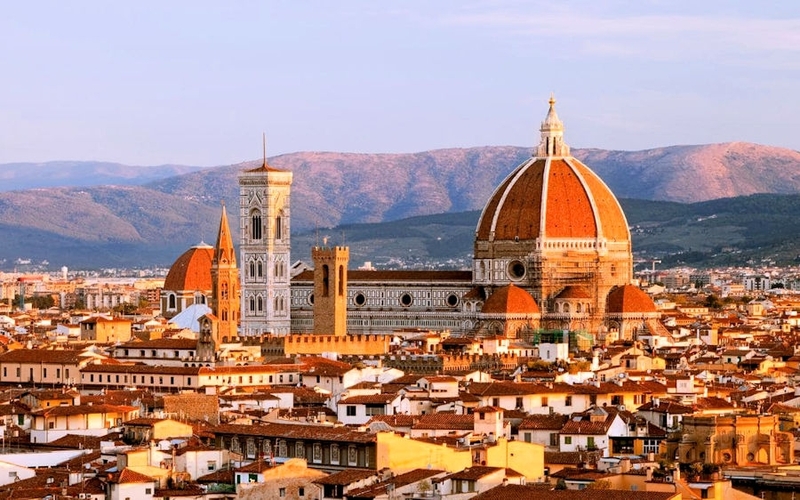 Your Local Specialist gives a superb commentary of the city's history during your walking tour, which includes views of the Baptistery, Cathedral of Santa Maria del Fiore, the impressive Giotto's Bell Tower, Ponte Vecchio and a visit to Piazza della Signoria. Learn about the quality and workmanship of two of this city's historic industries at demonstrations of Florentine leathercraft and 18-carat gold. Don't forget to try a gelato! Later enjoy dinner at the hotel. Your journey continues north across the dramatic Apennine Mountains to Verona, the home of Shakespeare's star-crossed lovers. View the vast Roman Arena, where concerts are still held regularly each year. Stop and view Juliet's balcony in a courtyard which has become a popular tourist site for the tragic story of the Montague and Capulet family feud. Head east to the magical, romantic city of Venice. Watch the Venetian craftsmen at work creating local specialities at a glassblowing workshop on Giudecca Island. Then cruise by private launch to St. Mark's Square in the heart of Venice. Admire the Bridge of Sighs, the ornate Doge's Palace and the Byzantine Basilica of St. Mark. Spend free time afterwards exploring this fascinating city or perhaps take a cruise across the lagoon to Burano for a relaxing farewell dinner. 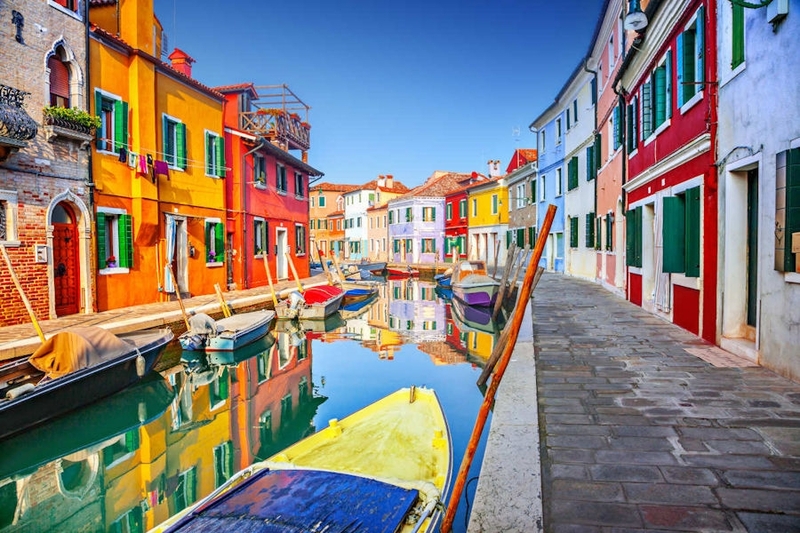 Burano is an island in the Venetian lagoon known for its brightly coloured houses. This morning say 'arrivederci' to your Travel Director and newfound friends and return to Venice San Marco Square area where you’ll be staying for three more nights. Now you can slow down and relax. According to Venice for Visitors website, the #1 Mistake travelers make is what they call “Hit and run” visits. You will avoid that mistake and really get to know this magical place. Maybe you'll end up joining the ranks of those travelers who can't get enough of Venice and discover new things about the city with every visit. There's a lot to see beyond the usual tourist attractions: e.g., the islands of the lagoon, the ancient Jewish Ghetto, and the bridges, canals, back streets, and shops of neighborhoods that hurried and harried tourists never see. Many sights won't cost you a anything except perhaps a vaporetto (water bus) ride. For example – The Grand Canal. Take a vaporetto preferably in the evening, when the day-trippers have gone home and the palazzi along the canal are floodlit or illuminated from within. If you're on one of the older boats with an open bow, sit up front; otherwise, grab a seat in the covered open-air section at the boat's stern, beyond the doors at the rear of the vaporetto's enclosed passenger compartment. As the water bus zigzags between stops on both sides of the canal you'll pass under several bridges and see dozens of palaces that were built from the 12th to 18th centuries. Your Lonely Planet guide and a special traveler website will provide everything you need to plan your trip. Leave your bags at reception and spend the morning doing some more of the things on your to-see and do list. Later today you’ll take a water bus to the cruise port to board your ship that will take you on a completely different adventure. Note: This cruise is in high demand and bookings are subject to availability for your travel dates. If this cruise is not available for your preferred departure date, we will find an alternative to suit. 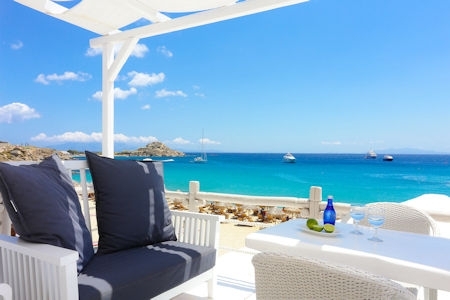 Optional: 8-night Athens & Greek Island Hopper package. See details in “Inclusions” above. 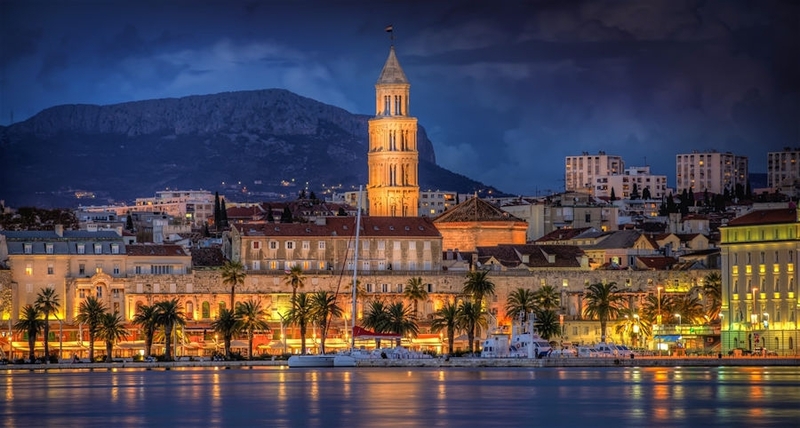 Croatia's second-largest city, Split (Spalato in Italian) is a great place to see Dalmatian life as it’s really lived. Today is just a day to relax and enjoy the facilities of your luxury cruise ships and share some time with any new friends you’ve made. You’ll either love or hate Santorini. Its magnet, the multicoloured cliffs that soar above the sea-drowned caldera, are amazing indeed. Mykonos is the great glamour island of Greece and flaunts its sizzling St-Tropez-meets-Ibiza style and party-hard reputation, with bronzed bodies thronging its beaches by day and basslines pounding through its superclubs until dawn. You can enjoy everything Mykonos has to offer through Day 14 and into the night if desired, then re-board the ship around midnight because we depart at 3am. 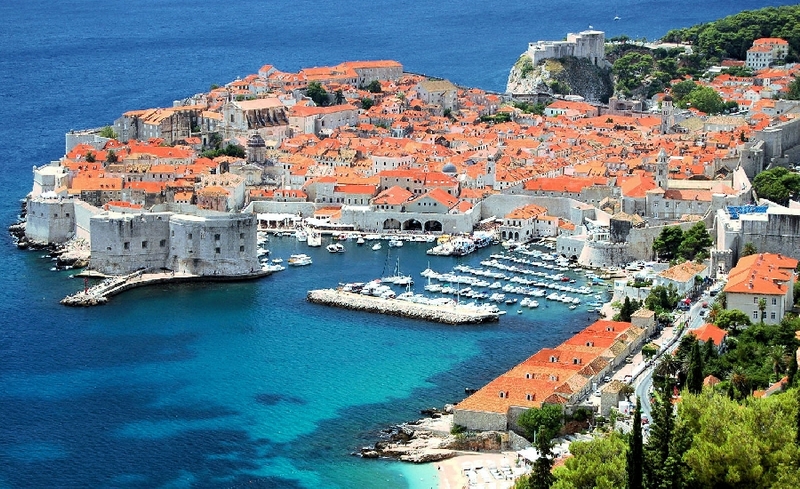 Regardless of whether you are visiting Dubrovnik for the first time or the hundredth, the sense of awe never fails to descend when you set eyes on the beauty of the old town. This morning after breakfast you’ll leave your cruise ship behind and head to the airport for your trip back to Australia. If time permits, you can leave your bags at Piazzale Roma near to the cruise port and head back into Venice for the day. Of course you might like to extend your Italian holiday with a trip to Milan and famous Lake Como and Lake Maggiore. Spend 3 days in some of the most charming cities of Southern Italy. Explore bustling Naples, marvel at the UNESCO-listed ruins of Pompeii and take a boat ride to Capri's magical Blue Grotto, before enjoying a stroll around beautiful, colourful Sorrento. Leave Rome behind and take in stunning views of the Roman countryside as you head to Naples. Renowned as the birthplace of Italian pizza, Naples is also an important cultural and historical centre. Enjoy a panoramic tour of this lively city before making your way to the fascinating ancient ruins of Pompeii. 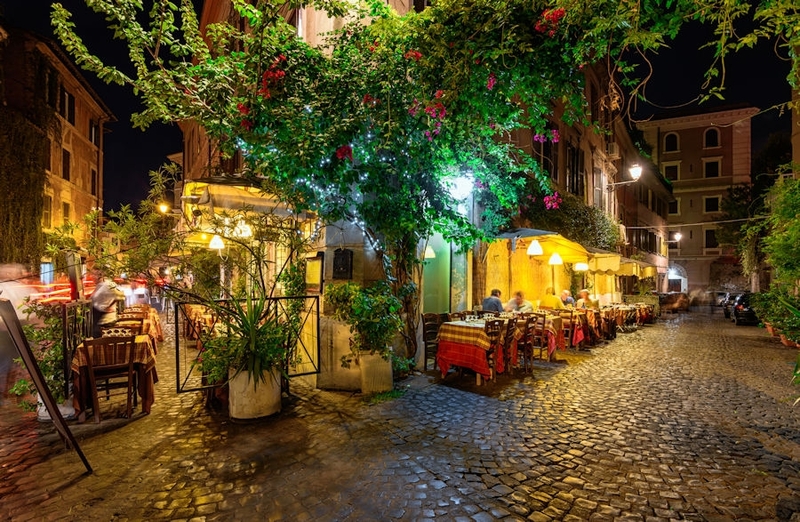 Your tour ends with a delicious dinner and overnight stay in Sorrento. After breakfast, reach the charming island of Capri and enjoy a boat ride to the Blue Grotto. Relax and take in the stunning scenery, the sunlight passing through the underwater cavity, creating a magical blue light that illuminates the grotto. Discover the elegant town of Anacapri and head back to Capri for a traditional lunch. 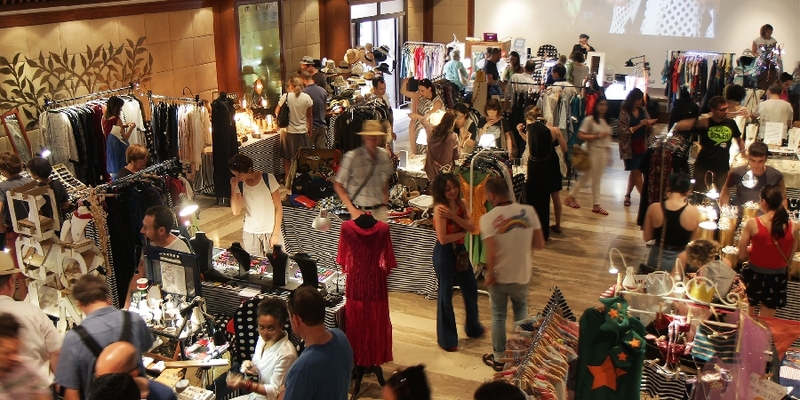 Later, take some time to explore the area, and maybe do a little shopping before heading back to Sorrento. Wander around Sorrento's pretty streets and take pictures of the stunning blue sea. Due to an abundance of lemons in the area, sunny Sorrento is renowned for its production of limoncello, a famous digestif made from lemon rind. Taste some limoncello, or perhaps buy a bottle to bring home with you, before returning to Rome in the afternoon. Extend your stay in Sorrento to visit the Amalfi coast including Positano, Ravello and Amalfi. Consider this tour package to follow some time in Rome before joining your main northern tour. 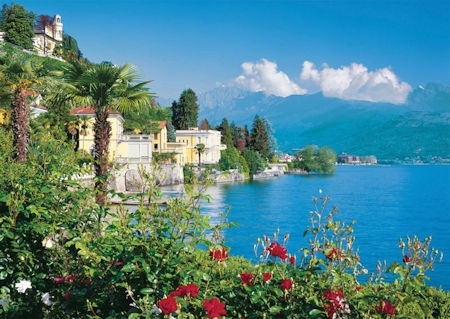 5-day Italian lakes extension: $899 per person. After a day of relaxing and taking in the sights of Milan, you'll travel north to the breathtakingly beautiful Lake District region. Perhaps most well-known is Lake Como. 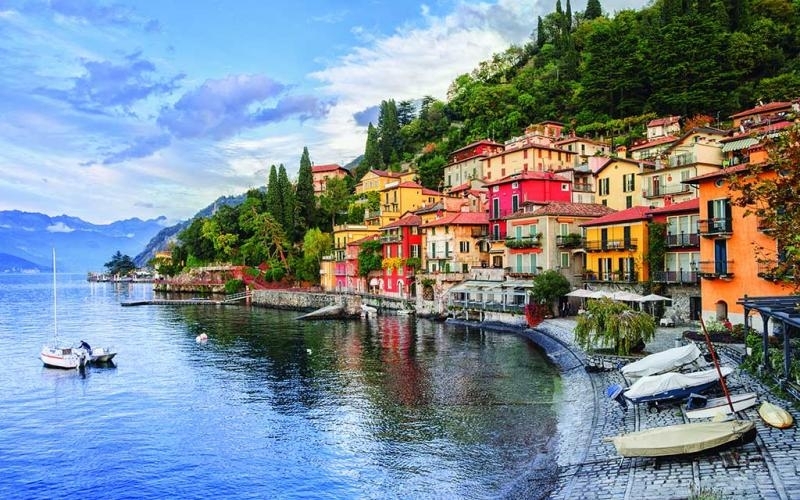 Here you'll explore the enchanting village of Bellagio and enjoy a relaxing boat ride on the lake before returning to Milan. Next day, you'll visit the fashionable town of Stresa and the incredibly beautiful islands on Lake Maggiore and take a boat cruise around the Borromean Islands, stopping at Isola dei Pescatori for some shopping and sightseeing. 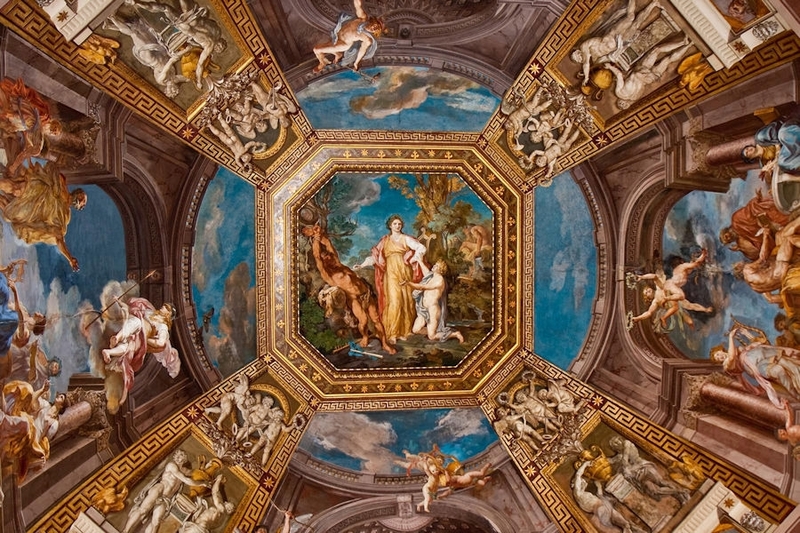 Afterwards you'll head to Isola Bella to see the opulently decorated Borromean Palace. A wonderful addition to your European Delights package. Gaze out the window at the shifting landscapes as you leave bustling Milan behind and head for the foothills of the Swiss Alps. 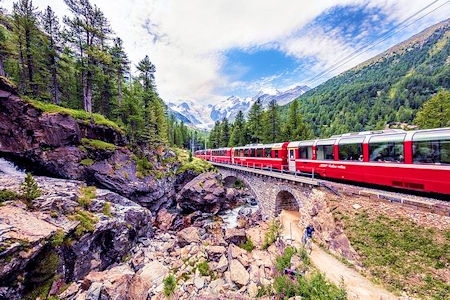 Board the Bernina Express and journey through gorges and past glacier lakes, reaching heights of 7,400 feet (2,250 m) before alighting in the chic winter resort of St Moritz. Return to Milan via coach after speninf some time in St Moritz. Consider stopping in Singapore for one ot two night on the way back to Australia to break the trip. Price is from $299 total for two people according to preferred hotel standard, including round-trip, private airport transfers. Read what members have had to say in emails to us about our services. Scroll down and click/tap the headings to read more. "Hi, have finally returned. Wonderful, wonderful trip. We think we loved Paris and its age/artworks but all was full of laughter fun and learning. Paris apartment was beautiful, & quiet when windows were closed, which wasn't bad anyway. The street is full of lots of restaurants and cafe's. (we also loved Shakespeare & co bookshop.) Fruit and chocolates in most rooms and champagne which I think we only drank in Brussels. we were ready for bed everywhere else though we almost had it for morning tea at Amsterdam on check in. Magnificent. Cheers." Val C.
"Have just returned from our wonderful trip to the UK. Just wanted to say a huge thanks for your organisation, we had the best holiday ever, an absolutely marvellous time, the tour was magnificent. We would recommend the Trafalgar Britain and Ireland Winter delights tour to anyone who wants to do adventurous travel, learning about other countries, and making friends. The coach was actually over half full of Aussies! Thanks so much for organising such a memorable holiday for us." Lee D.
"Deb and I are very grateful for the work you have put into our holiday. 10 days in and we are blown away by the quality and location of the motels and apartments. Many thanks." Jen W.
"My husband and I have recently returned from a holiday to Canada and Alaska booked through Australian Escapes. The itinerary was planned to take in all aspects of the holiday we required. The travel transfers worked seamlessly and the accommodation was at a standard that met our expectations of comfort and location. We absolutely loved the cruise and surprise upgrade to our stateroom. From our experience with this recent trip I would recommend Australian Escapes." Margaret & Bill T.
"We've arrived back safely after a thoroughly enjoyable trip where all the arrangements ran like clockwork, for which we want to thank you and your team, especially Sonya and Skye. We'd have no hesitation in recommending you and Volga Dream cruises to anyone who asks. Kind regards and thanks again." Irene and Blake S.
"I want to thank you for all the accommodation you arranged for us during our holiday in North Queensland in August. It was all excellent. The transfers went very smoothly too and we couldn’t have been more pleased with our holiday. Thank you for making everything so easy." Gloria K.
"My life has been like a whirlwind since I got back. I am now on holidays and catching up with people that I have not had time to contact since coming back. Thank you so much for organising my trip to The States and Canada for me. I had a great time and everything went really well. All flights went well. The hotel you booked me into in Champaign was a really old home with beautiful gardens, all done up and run by two gay guys. It was really quaint and I loved it. I had a great time, everything went without a hitch, I loved all the accommodation that you organized for me and I would like to wish you a happy Christmas and all the best." Marlene S.
"A message of thanks to you and your staff. The holiday went off without any problems and we thoroughly enjoyed ourselves and and had a wonderful time. Again many thanks." Dianne D.
"We are back and rested after a hectic few weeks (away), but everything worked out extremely well. Thanks so much for all your organisation – once you get used to the trains and buses, life becomes easy. Once again, thanks to you and the team for all the organisation from both Lorraine and I – we really enjoyed the holiday. All the best." Bob C.
"We just wanted to let you know that the arrangements you put in place for us in WA worked beautifully. You said the Margaret River accommodation was exceptional and it certainly was both in terms of location and facilites. Thanks again." Betty and Clancy S.
Read more reviews from Product Review.com.au below. Please be sure to read management comments on negative reviews to get a balanced perspective. Any initial deposit paid is held in our PayPal account and will be released back to you if you do not proceed with the travel package. (Bank transfer option available.) After approval, this and any further deposit paid is applied within 24 hours to various components of your travel package and remitted through to suppliers. Reservation status may be verified with the supplier after remittance. Confirmation of such booking(s) will be sent to you on request within 7 days. Final payment, when received is applied in the same way. Supplier confirmations including vouchers and e-tickets are then sent to you for all such finalised items.